Find Out If The Miniature Schnauzer Temperament Is A Good Fit for You? Find Out If The Fearless Miniature Schnauzer Temperament Is A Good Fit for You? The friendly Miniature Schnauzer temperament is full of character. These little dogs have a commanding presence and a lot of smarts. But is the Miniature Schnauzer the right dog for you? Here is what you need to know about this little dog with a big personality. The Miniature Schnauzer is a very smart dog. In fact, he comes in 12th place out of 80 breeds when measuring intelligence. This means you’ll have to work extra hard to stay one step ahead of him to make sure you are giving him enough mental stimulation to keep any potential bad behavior at bay. If you don’t find ways to keep this dog entertained, then expect to find him using his intelligence to do things like open cupboard doors looking for toys and treats, or finding ways to escape in search of adventure. There are several activities that can put the Miniature Schnauzer temperament and intelligence to good use. 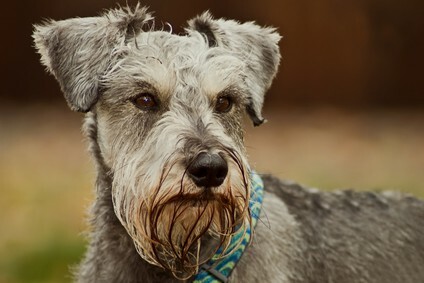 As a terrier type, the Miniature Schnauzer has a strong drive to dig for rodents and Earthdog activities can give him a way to do this without digging up your backyard. Earthdog activities test your dog’s ability to hunt and find a particular target, and they are non-competitive. Speaking of your backyard, you’ll want to make sure that you keep your Schnauzer in a well-fenced area or on a leash. Otherwise, he may run off after a squirrel or rabbit. Agility exercises not only give your dog something to think about and puzzles to solve but will also give him the physical exercise he needs. It is also a great way to spend time with your dog and create an even deeper bond of friendship and loyalty with him. It seems that the smarter a dog is, the more challenging it can be to train him. This proves to be true with the Miniature Schnauzer. It takes a strong leader to motivate these independent little dogs who otherwise don’t like you telling them what to do. They are very adaptable, so they make great traveling companions. The alert Miniature Schnauzer temperament makes them great watchdogs in that they are on high alert when strangers are around. 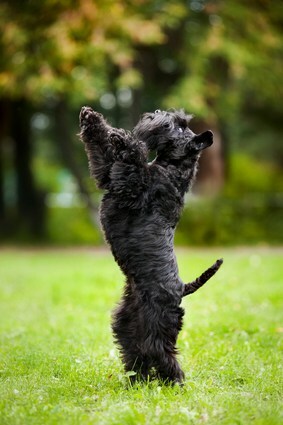 Even though they are small, Miniature Schnauzers are sturdy and athletic. While fun and polite little dogs, there are some things about these dogs that you may find problematic. They bark. A lot. His combination of being smart and alert means that the Miniature Schnauzer sounds the alarm at even the slightest sign of trouble (even if it’s not real trouble). While you can’t train a dog not to bark, you can teach him to stop barking on command. This is necessary in order to have a peaceful home. They are not great with young children– While the Miniature Schnauzer temperament makes them perfect for families with older children, they don’t have the patience to put up with children under the age of 6. They can be stubborn– It will take effort on your part to find out what motivates your Miniature Schnauzer, as each dog is different. Once you know what works, you can establish a training routine that helps him continue to do what you ask of him. While you may have fallen in love with the breed, the truth is that Miniature Schnauzers aren’t for everyone. 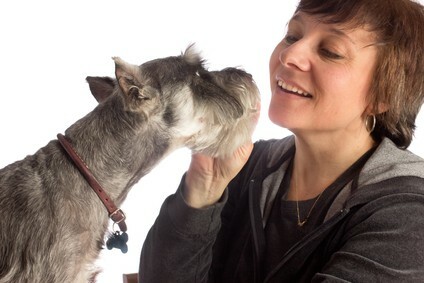 Make sure you understand the commitment needed to properly train this dog before you bring the feisty and independent Miniature Schnauzer into your home. Remain calm but assertive.The Miniature Schnauzer temperament demands that you take a solid leadership role to ensure he learns his role in the pecking order. Begin training as early as possible.The younger you start training this breed, the easier he will learn. Early training not only establishes your role as his leader but also sets him up with a pattern that your dog can learn to rely on as he grows. Use positive reinforcement.Strong-willed dogs shut down when you use negative reinforcement, like spanking or yelling. Miniature Schnauzers are highly motivated by food and praise. For more tips on disciplining your dog correctly, click here. Keep activities varied.These smart little dogs get bored with repetition, so you need to find new ways to interact with him on the regular. Once you have trained your Miniature Schnauzer on basic obedience, challenge him with new games like hide-and-seek, which can be fun for the both of you. Miniature Schnauzers are almost identical to Standard Schnauzers with only a few differences between them. Because they’re smaller, and because they have a tendency to bark, people may view Miniature Schnauzers as “yappy,” even though their larger counterparts bark just as much. The Miniature Schnauzer also tends to pick his “person” – that is, the one person he grows closest to in the family. You also need to be more careful with the Miniature Schnauzer around small animals, like rodents, birds, and kittens, due to their hunting streak. The earliest records on the Miniature Schnauzer come from the 19th century out of Germany. Originally, Germans bred Miniature Schnauzers to hunt rats, herd cattle and guard property. Germany brought the Miniature Schnauzer to the U.S. in 1924, and two years later the AKC recognized the Miniature Schnauzer as an official breed. The Miniature Schnauzer’s coat requires frequent brushing and combing to look his best, though he doesn’t actually shed much. Most Miniature Schnauzer owners actually take their pets to groomers every five to eight weeks or so to get their coats professionally trimmed. Give your Miniature Schnauzer a bath once a month or so, depending on how dirty he gets. You should also regularly trim his nails (once a month) and check his ears weekly for debris and wax. As far as Miniature Schnauzer colors go, he comes in black, white, salt & pepper, and black & silver. You must exercise your Miniature Schnauzer every day to keep him in peak mental and physical health. He has a medium energy level, which means he will do well no matter where you live, whether that’s in the city or the country. He is happiest when he’s with his family and can do activities together with them. Because of his strong prey drive, though, always keep him on a leash or in a fenced-in yard. The last thing you need is him running off to chase prey and getting lost or worse, getting hit by a car. The average Miniature Schnauzer weight is between 12 and 20 lbs., and their average height is between 12 and 14 inches tall when measuring at the shoulder. The Miniature Schnauzer's life expectancy is between 12 and 15 years. Note: if you agree that your health and your dog's health should be a top priority then get a copy of The Ultimate Guide to Dog Health. Your Miniature Schnauzer friend will love you for it. This guide will help save you money, time and most of all help you keep your dog healthy. If you have read all you need to know, and you'd like to add a Miniature Schnauzer puppy to your family, you’re probably wondering how to go about doing that. You can find a Miniature Schnauzer for sale from a Miniature Schnauzer breeder or through your local rescue organization. The average Miniature Schnauzer price varies widely and can be anywhere from $500 to $2,700. This makes the Miniature Schnauzer pricier than other Schnauzer breeds. If you want to adopt a Miniature Schnauzer puppy, it is a great idea to consider adoption as your first option! Adoption is a great way to find your new best friend while also helping an animal in need. Something important to note is that most Miniature Schnauzers available through adoption agencies are adults. Adopting an adult Miniature Schnauzer comes with a lot of perks. For one thing, older dogs have prior training, including housetraining. They are also calmer and have grown out of the chewing stage. Visit your local animal shelters and humane societies. Talk with the adoption counselors and let them know that you are interested in adopting a Miniature Schnauzer. Ask if it is possible to leave your contact information on a waiting list for a Miniature Schnauzer. If you are willing to check out other similar breeds, be sure to mention that to the counselor. Also inform them of whether you are open to a Miniature Schnauzer mix. Mixed breeds are beneficial because you can often enjoy the same personality traits but without the genetic issues that often come with purebreds. The cost of adoption varies. The average adoption fee at an animal shelter is typically between $75 and $150. Rescue groups often charge more for their specialized services. One benefit of adopting a Miniature Schnauzer is that it is spayed/neutered and assessed by a vet before the organization releases him to you. Some people decide to work with a Miniature Schnauzer breeder instead. If you decide to explore Miniature Schnauzer breeders, you will need to be extra careful to find an ethical breeder and avoid puppy mills. Unethical breeders and puppy mills sell puppies to make money. They don’t care about whether their puppies are in good health or behave properly. They also do not consider or care that the puppies they produce will likely end up in animal shelters because they have behavior problems their owners can’t control. On the other hand, responsible breeders pay more attention to creating happy, healthy puppies, and they make sure they find good homes for all their dogs. They also require their buyers to sign spay/neuter contracts to dissuade them from contributing to overpopulation. It can be difficult to find an ethical breeder, but it is worth the extra effort. Never simply order a Miniature Schnauzer puppy over the internet or buy one from a pet store. It may seem more convenient, but you are almost certainly supporting a puppy mill with your purchase. Conclusion: Why the Miniature Schnauzer? The Miniature Schnauzer temperament is not for everyone, but he can make for a terrific family pet if you put the time and effort in to getting to know him. Just refrain from having him in the house with small children or small pets. He may pursue smaller animals as prey, and he doesn’t have the patience for energetic children.